Having just spent the past 6 days in New Orleans I have lots of food stories to tell. Although I was there for a convention I was able to squeeze in some really good dining experiences. My first night there I made my way through the French Quarter to Cafe Du Monde, for their well known beignets and chicory coffee. Boy, am I glad I did. The beignets and coffee were delicious. Needless to say I went back several times before the end of my trip. 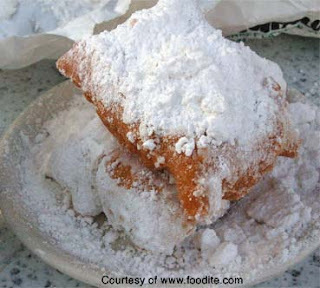 Beignets are French pastries of deep fried dough served with mounds of powdered sugar on top. If that isn't enough to temp you the cafe au lait will. At Cafe Du Monde chicory is added to the coffee to lessen some of the bitter taste. The combination adds a slight chocolate flavor to every cup. You can get your coffee served black or with 1/2 milk (au lait). Cafe Du Monde is open 24 hours and there always seems to be a crowd both inside and out. I can't say I wonder why. This is definitely a must stop if you're ever in New Orleans.